Our glues and solvents are rotated quickly and stored in an air-conditioned and heated facility in order to guarantee freshness and effectiveness! 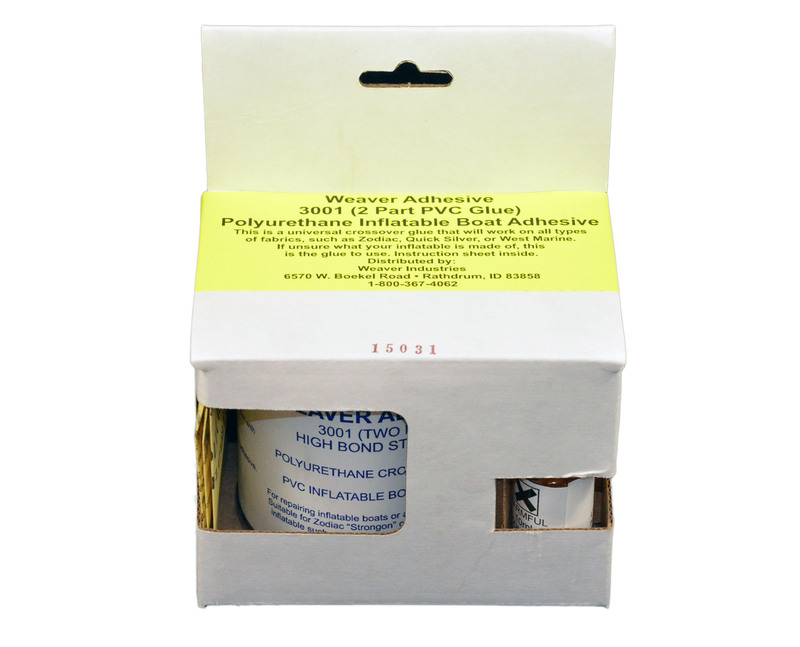 Weaver PVC 2-part adhesive, 8 ounce, for gluing on rubber pads, adding lifting D rings and making repairs to Zodiacs and inflatables made from PVC material. This glue is now a crossover meaning it will work on PVC or Hypalon so if you don’t know what your boat is made of, this is adhesive to purchase. Important Shipping information: Adhesive, MEK, Toluol, Liquid Rubber, and bottom paint is considered regulated material. It can only be shipped via ground transportation. It cannot be shipped via the United States Postal service Priority mail. If you choose Priority Mail as a shipping method, it will be shipped via the United States Postal Service Parcel Select, this service may delay delivery up to 7 days. The fastest method for shipping regulated material is UPS Ground. The activator/curing agent will last approximately 7 days after opening. Once the 2 parts are mixed together, you will have a 4 hour working time before the glue begins to harden. Single part Vyna-Bond Glue has a longer shelf life and will last approximately 1 or 2 months after the can is open. For single part Vyna-bond glue, Orange Off Cleaner, Adhesive Remover, MEK, or ToobSeal Interior Repair Sealant, please see related products below. These products are essential for keeping your boat clean, and MEK is the required PVC solvent for a successful repair. Unopened, the glue will last one year. 1. Use PVC glue in a well ventilated area. Do not use in high humidity, in the rain, direct sun or near the water. It is recommended that the humidity level not be above 60%. 2. If possible, the tube should be inflated why gluing. 3. Prep the surface of the PVC inflatable with MEK solvent to soften the fabric. Do not scrub the surface, just wipe with a clean rag in one direction. 4. Mix the A 110 curing agent thoroughly into the adhesive for 2-3 minutes in the amount supplied. 5. One half hour prior to gluing the pads, coat the pad, D ring or patch and the inflatable with a thin coat of glue. Put the lid back on the can. Remember the glue has a 4 hour pot life. 6. Once the half hour is up, apply a thin coat of adhesive to each surface and allow 2-5 minutes until the glued surface is dry to the touch. Reapply another thin layer of glue to each surface. 7. Bring the two coated surfaces together using sufficient pressure to ensure intimate contact, taking care not to create any air pockets. Use a roller rasp or deflate the boat and use your hand on the backside of the tube to force out any air pockets under the pad or patch. 8. Allow to set for at least 48 hours. PVC Patches for Inflatable Boat Repair, 6, pre-sanded.